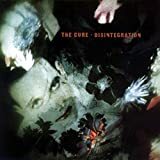 In 1989 The Cure released Disintegration, and the title couldn't be more appropriate. The album starts off with a bit of optimism, and even a mention of love. Songs like "Pictures of You" and "Love Song" talk of pain being numbed by loved ones. However, by the time "Lullaby" is played it is evident that every shred of hope and joy is slowly being torn to shreds. And by "Disintegration" and "Homesick" it is obvious that there is no hope left whatsoever. Beautifully crafted darkness is how I would describe this album. I love listening to it on my headphones while I go for long walks through the city on cold nights. A must for anyone who has ever been sad. one of the first cure albums i ever got and one of the most beautifult hings to come out of robert smiths' funny looking head. mostly slow, but beautifully arranged, with wonderful melodies, great lyrics, and even silly moments help make this the cure's masterpiece. buy it. this album is just amazing. best goth album ever.